Figure 7 of Querques, Mol Vis 2009; 15:2960-2972. Figure 7. Color fundus photographs and spectral domain optical coherence tomography scans of patient CT13 and patient CT12. 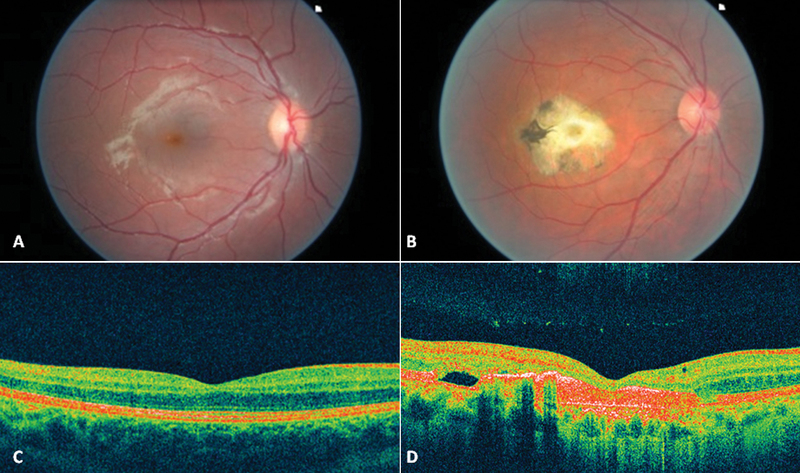 A normal fovea and an atrophic macular lesion are shown on color fundus photographs of patient CT13 (A) and patient CT04 (B), respectively. Spectral domain high-definition optical coherence tomography scan shows, in the macular area of patient CT13, a thickening of the layer corresponding to the junction between the retinal pigment epithelium (RPE) and the interface of the inner segment and outer segment of the photoreceptor (C). A thinning of all the retinal layers with enhancement of reflectivity of RPE, which seems to spread far behind it (D), appears on the macular scan of patients CT12.